This is the fifth year of the Loon Lake Property Owners’ lake water quality monitoring program. Once again I must remind all who read this that although another year of data gathered does permit general comparisons to the previous years, scientific methodology insists that many observations over several years must be made before definitive conclusions can be made about water quality trends. Notwithstanding the above, there is little room left for skepticism regarding the extent to which Loon Lake’s water quality is deteriorating, how long term or short term it may be, how much of it is man made, and what if anything we can or should do about it. The data is becoming increasingly convincing. 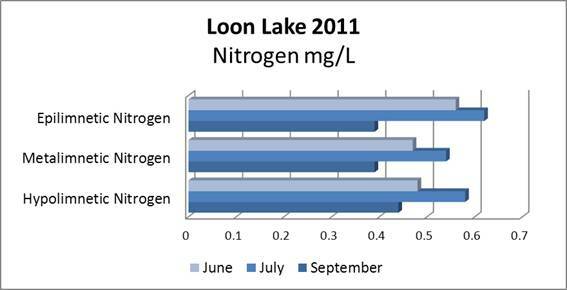 Loon Lake water quality has been and is deteriorating. It becomes apparent when historical data is compared to the newer data that became available from our five years of water column studies. These results show that in the middle to late summer below 15 meters depth there is insufficient dissolved oxygen to sustain healthy, deep/cold water Kokanee and Mackinaw fishery. The data validates studies for the Washington Department of Fish and Wildlife that point to an anoxic hypolimnion limiting Loon Lake salmonid habitat (Scholz et al, 1988, McClellan et al, 2005). Note: Detailed original data, original field notes including conditions and volunteer staff present are not included in this report. If you need this information please contact J. Davies at 233-2651 or the Loon Lake Property Owners Association – Water Quality Monitoring Project Leader. WATER CLARITY: The clarity of the lake’s water is measured by submerging a Secchi disk until it disappears. In 1985 the Fisheries study conducted for the Department of Fish and Wildlife) by EWU reported a summer average of 6.5 meters (21 feet). The 2007 Secchi disk measurements averaged very close to those 1985 averages, (6.1 meters - 20 feet). The 2008 measurements averaged 6.8 meters (22.1 feet). The 2009 measurements averaged 6.95 meters (22.6 feet). 2010 measurements averaged 6.2 meters (20.2 feet). 2011 averaged 5.3 meters (17.4 feet). Note: The Lake is also measured from top to bottom for temperature, dissolved oxygen, pH and conductivity with our Hydrolab Data Sonde. This instrument is calibrated before and after each use. It is stored and cared for by LLPOA/LLDF citizen volunteers that have been trained for its use, storage and maintenance. TEMPERATURE: The temperature measured over depth for each field trip is shown in Figure 2. It clearly shows the typical summer stratification. The profile shows an epilimnion (top warmer layer), the metalimnion (middle layer where temperature drops relatively quickly with depth), and the hypolimnion (bottom layer, which is cold). DISSOLVED OXYGEN: When the lake is thermally stratified, the bottom layer cannot reoxygenate by mixing with the upper layer. The bacteria responsible for the decay use up almost all the oxygen in the hypolimnion. Figure 3 shows that there is plenty of oxygen in the upper part of the water column but later in the summer the dissolved oxygen goes to less than four milligrams per liter (mg/L) below approximately 15 meters. At this concentration of dissolved oxygen, fish cannot survive for long and phosphorus starts to be released from the sediments. 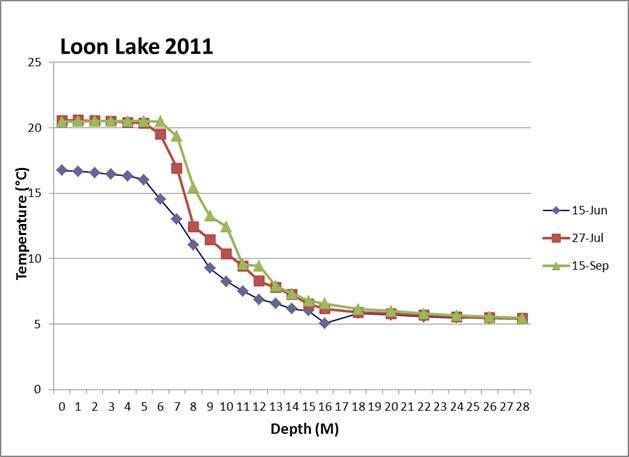 The dissolved oxygen levels found in 2011 below 15 meters in Loon Lake are not good, but similar to those found in previous years. 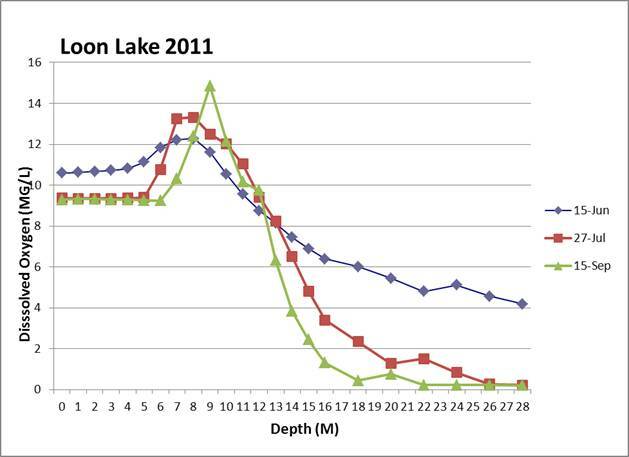 Figure 3: Loon Lake Dissolved Oxygen Profiles – Note: Dissolved Oxygen is shown in milligrams per liter (mg/L). A milligram is one one thousandths of a gram. NUTRIENTS: Elevated phosphorus in the hypolimnion caused by the summer’s decay of organic matter can be seen in Figure 4. Phosphorus gets remixed into the lake during the fall. This fuels the next year’s algae growth. Loon Lake Sewer District #4 was formed to stop phosphorus from entering the lake. However it is important that remaining sources of phosphorus are minimized. These sources include; storm water from hardscape (roofs, driveways, roads, etc. ); fertilizer from landscaping and; remaining septic systems with drain fields. It is also important to provide shoreline vegetative buffers and maintain wetlands adjacent to the lake in order to absorb nutrients (most importantly phosphorus) as they migrate toward the lake. Nitrogen, although an important polluting nutrient, is not nearly so dangerous to the lake environment, especially without attendant high levels of phosphorus. All new development within the Loon Lake drainage system (The Loon Lake Watershed) should be regulated in such a way so as to retain wetlands in their natural state; minimize or prevent runoff; prevent contamination of the aquifer from sewage systems through export of effluent to a location outside the watershed as does Sewer District #4; and protect uplands from inappropriate development so that the aquifer may continue to be recharged by precipitation. CHLOROPHYLL a: Chlorophyll a sampling is done on the surface using a Kemmerer Capture Bottle. Two 300 mL samples are blended from 100 mL quantities collected at depths of 1, 3, and 5 meters. Sample bottles are wrapped in foil to protect them from light, are kept in cold storage until delivered (within two hours) to the Spokane Tribal Lab for analysis. Analysis results of the two samples are averaged.